Summer, sand and surfing – hardly any other country on the planet is more associated with outdoor activities than Australia. Due to the climate, Australian lifestyle is closely linked to activities under the bright sun – as well as in and underneath the surface of pools and open water. As a result, most children growing up in Australia have access to water and water-related activities. Therefore, it is not surprising that Australian athletes belong to the world’s best in these disciplines. 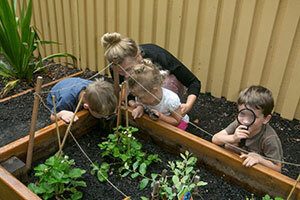 The ‘Little Scientists’ – a not-for-profit initiative of FROEBEL Australia and the “Little Scientists’ House Foundation” in Germany – advocate the idea that young children all over Australia have access to scientific exploration as much as they have to water-related sports. Based on the fact that children are inquisitive by nature, the organisation aims to enable children between 3 and 6 years of age to explore their interest in scientific subjects. To make scientific exploration accessible on a regular basis, the ‘Little Scientists’ offer a professional development workshop program for early childhood educators to encourage and enable an active implementation of scientific content into their work. Based on the idea of ‘stepping into children’s shoes’, the educators experience STEM* education on an age-appropriate level and learn how to support children in finding answers themselves. All workshops are built around using existing, everyday materials, to make experimenting and exploring at their centres as accessible as possible. Furthermore, the Little Scientists program not only encourages scientific exploration, but also aids in the development of fine motor skills, self-confidence, social skills and language, it is an excellent tool for teachers and educators to meet a range of requirements of the National Quality Framework (NQF) and the Early Years Learning Framework (EYLF). Also, the reservations teachers and educators may have towards scientific, technological and mathematical topics can be reduced and their interest in these topics sparked. In Germany, the initiative was launched in 2006 by a number of companies – including Siemens, McKinsey and SAP’s Dietmar-Hopp-Foundation – and is co-funded by the German Federal Ministry of Education and Research. In the meantime, it has become the largest early education initiative in Germany, with more than 1 Million children from more than 26,500 education and care services participating in the program. Following the example from Germany, the organisation is aiming for a nationwide ‘Little Scientists’ community. Currently, the initiative is building a network of institutions that are interested in their ‘train-the-trainer-approach’ (for more information please get in touch with the ‘Little Scientists’), corporate and political partners as well as teachers, educators, parents and grandparents to provide a ‘scientific pool’ for every Australian child. If you would like to support the future of science, technology and mathematics in Australia and help to make ‘Little Scientists’ available for all children in Australia, please contact Heike Schneider, the Network and Project Coordinator of the ‘Little Scientists’, via email heike@littlescientists.org.au or by calling 02 8080 0065.